A southeastern suburb of Prague. The city of Königliche Weinberge was built within a few years after the Austro-Prussian war of 1866, when the walls of Prague were removed. As the site had been formerly occupied by vineyards that were cultivated mainly by Jewish farmers, Jews may be regarded as the first settlers of the city. Many Jewish families from Prague moved into the new suburb as soon as it had been laid out; and approximately 400 families settled there about 1880. Still no need was felt for a distinct religious organization, as the new inhabitants retained connection with their former congregations at Prague. Special religious institutions and services were found to be necessary only after a number of Jewish families from the country went to Weinberge. The first services were held in the city on New-Year's Day, 1882, in a hall rented by Simon Engel of Raudnitz. Rabbi M. Stark of Horazdowitz, who had been teacher of the Talmud and of religion in secondary schools at Prague, was elected rabbi of Weinberge in 1884. He at once took steps for the building of a synagogue; and through his efforts a fund of 9,000 florins was raised. This sum was entirely insufficient; and as the congregation was unable to borrow money, having no security to give, the building of the synagogue had to be deferred until the congregation became a community with the right of taxing its members, in conformity with the law of March 21, 1890. With the sum of 1,000,000 crowns, borrowed from the state bank, an imposing building in the Renaissance style was erected. The small synagogue in the left wing, seating 200 persons, was dedicated in Sept., 1894; and the large temple, seating 2,000 persons, was dedicated two years later. The services are modern, with organ and mixed choir. Services in Czech are held by Dr. Wiener for the inhabitants of the city who speak that language. 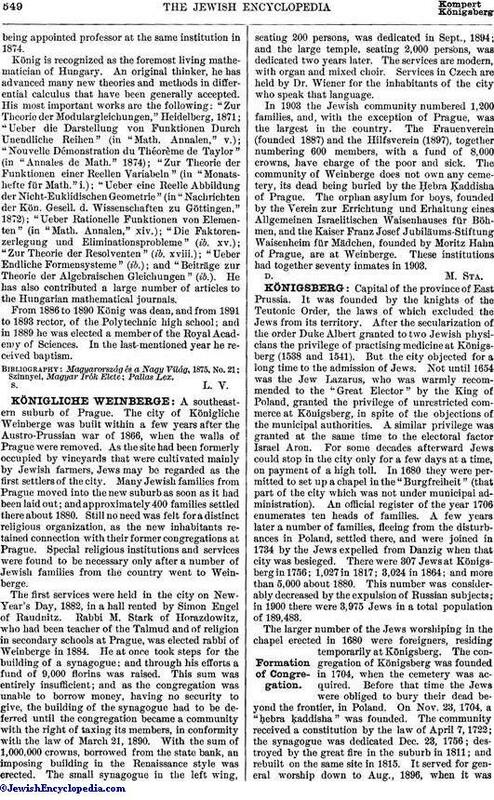 In 1903 the Jewish community numbered 1,200 families, and, with the exception of Prague, was the largest in the country. The Frauenverein (founded 1887) and the Hilfsverein (1897), together numbering 600 members, with a fund of 8,000 crowns, have charge of the poor and sick. The community of Weinberge does not own any cemetery, its dead being buried by the Ḥebra Ḳaddisha of Prague. The orphan asylum for boys, founded by the Verein zur Errichtung und Erhaltung eines Allgemeinen Israelitischen Waisenhauses für Böhmen, and the Kaiser Franz Josef Jubiläms-Stiftung Waisenheim für Mädchen, founded by Moritz Hahn of Prague, are at Weinberge. These institutions had together seventy inmates in 1903.